Her family belongs to the underprivileged family. Her father is the sister earner in the family. The father's income is not sufficient to meet the family needs. The parents are interested to educate the children. The parents approached us to support the child?s education. The child seems to be healthy at the time of admission. Parikshith stays with his parents. His father works as a driver and mother is a house maker. Her family consists of parents and one elder sister who is in grade 4. 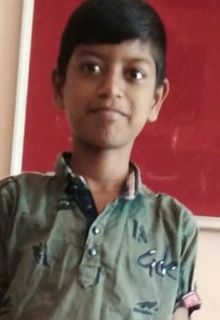 Tell your friends Parikshith needs a sponsor!